Clear the Clutter. Organize Your Life. Although organized people save time and money, and reduce stress and frustration levels, getting organized and de-cluttering your surroundings isn’t just about getting rid of stuff, it’s about making “space” in your life for friendships, adventure, possibilities, and fun. Nancy not only helps you de-clutter and create organizing systems and strategies, she helps you identify the real reason behind the clutter and disorganization so that you can achieve sustainable results. Do you frequently waste time searching for misplaced items? Does it take more time to locate the tools required for a household project than it does to actually complete the project? Are your monthly bills and other important papers “filed” in piles stacked on the dining room table? Have you incurred late fees because you can’t find your bills? Are you storing documents that you no longer need…and unable to locate the ones you do need? Are you buying things you know you already have…but can’t find? 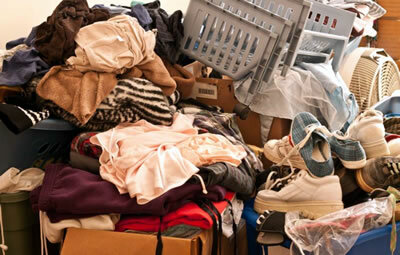 Has “clutter” taken over your kitchen counters, desk drawers, and closets? Has the attic, basement, or the space beneath your bed become your favorite new “storage” area? Have you never seen an empty space you couldn’t fill? Has the garage taken on the appearance of a self-storage facility…leaving no room for the car? Have you tried to get organized in the past but became too overwhelmed and frustrated? If your answer to any of the above is “Yes,” then you’ve come to the right place. First, she will help you evaluate and prioritize your organizational needs. She will then work side by side with you in the trenches helping you to de-clutter and organize whatever piles, drawers, closets, counter tops, desk tops, and secret storage spaces you may have. Then, she’ll develop a plan to efficiently arrange your possessions so you can not only locate needed items in the least amount of time, but also be able to maintain the organized space. Nancy can work with you on a project basis and also work with you on an on-going basis to help ensure you keep focused, organized, and as efficient and productive as you can be. Imagine how you’ll feel when you see the clutter disappear. Read Nancy’s published article about Getting Organized. Do you frequently waste time searching for misplaced items? Does it take more time to locate the tools required for a household project than it does to actually complete the project? Are your monthly bills and other important papers “filed” in piles stacked on the dining room table? Have you incurred late fees because you can’t find your bills? Are you storing documents that you no longer need…and unable to locate the ones you do need? Are you buying things you know you already have…but can’t find? Has “clutter” taken over your kitchen counters, desk drawers, and closets? Has the attic, basement, or the space beneath your bed become your favorite new “storage” area? Have you never seen an empty space you couldn’t fill? Has the garage taken on the appearance of a self-storage facility…leaving no room for the car? Have you tried to get organized in the past but became too overwhelmed and frustrated?